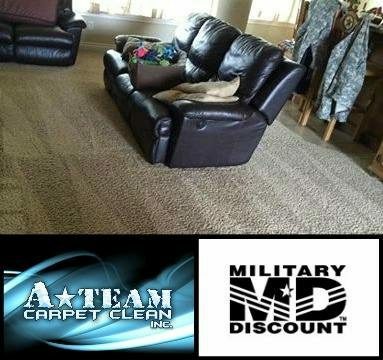 A-Team Carpet Clean Inc. – "We make it look good, smell good, and feel good!" We provide carpet cleaning, stain removal, carpet repair, carpet stretching, upholstery cleaning, tile and grout cleaning, and water damage extraction services. We even sell DIY Carpet Cleaning and Pet Stain Removal Products! A-Team Carpet Clean is family and locally owned and operated serving residents and businesses in Lawton, Fort Still, and surrounding areas of Comanche County, Oklahoma. We are also available 24/7 for emergency water extraction services in Lawton, Oklahoma. 10 years in business with over one hundred 5-star reviews! Our Team of cleaning experts are not only insured, they are trained and certified through the Institute of Inspection Cleaning & Restoration Certification (IICRC). A-Team Carpet Clean has been family owned and operated since 2009 by long-time residents of Lawton, OK, Chris & Krystal Collins. "5 star all the way. Called this morning for a quote, they came out this afternoon and were done in about an hour! Our carpets have never looked and smelled so good. We highly recommend A Team!" "Thank you so much for cleaning/sanitizing my Nana's furniture. Y'all did a great job!" ​"Amazing company. I called and needed my carpet cleaned. Just moved in and carpet full of cat hair which my girlfriend is allergic too. I explained this to the A-Team and without one hour they were at my house. Carpet looks fantastic, technician was the best. Go with the sure thing A-Team." ​​"Had a water leak five days before Christmas after hours. They saved our wood floors and cabinetry. Couldn't be more pleased with how polite, professional and quick they were able to come out and help. In today's world, it was very refreshing to have a company go above and beyond. Thank you, Chris!" "Great experience! A-Team Carpet Clean was helpful, quick and friendly! Excellent service!" "Chris came and patched a spot on our carpet that the cats scratched up. Professional repair. Would definitely recommend them for on-post repairs. Thanks!"